Williamsburg Presbyterian Church is located on the main road entering Colonial Williamsburg, directly across the street from The College of William & Mary. The original Church, built in the 1930s and added to in the 1950s, had become inadequate to meet the growing congregation’s needs. The former instrument, a modest mechanical action organ from the 1970’s, would have been too small and tonally limited in the new larger building. 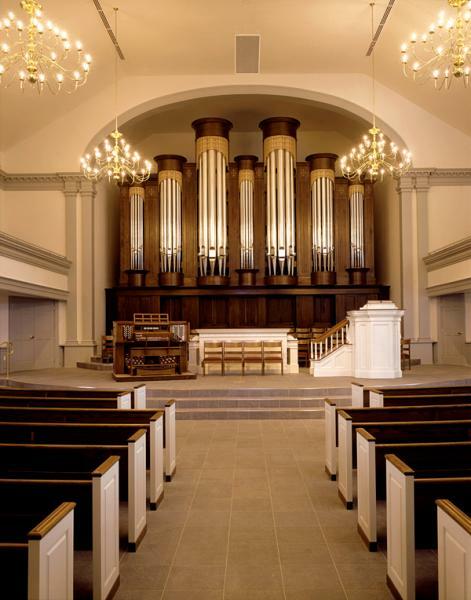 In 2002 the Church commissioned architect William Thompson, liturgical consultant Terry Byrd Eason, and acoustician Dana Kirkegaard, to design a new building, to not only meet the Church’s liturgical requirements, but also to be a buoyant environment for graceful musical expression. 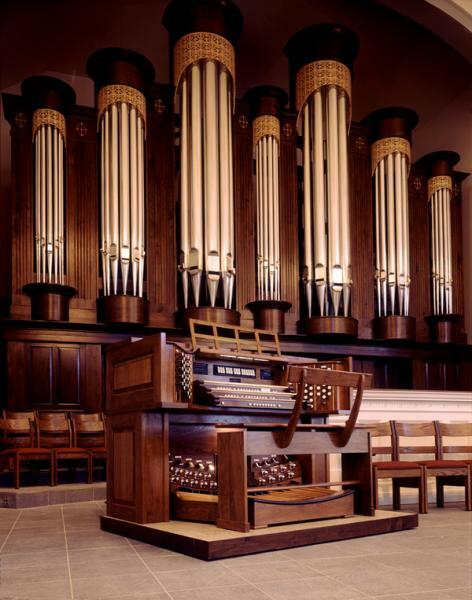 Our firm was selected to design and build the new organ, the 32nd of our firm’s manufacture. One of the hallmarks of our tonal style is an enveloping warmth of smooth tone, in the context of an historically informed approach to the scaling and voicing of the pipes. 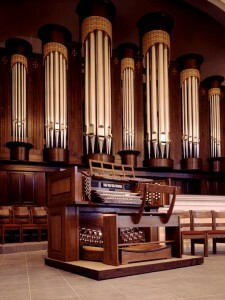 The enviable music ministry at Williamsburg Presbyterian Church demanded an instrument which could support congregational singing at all volume levels, “text-paint” the words with relating evocative sounds, accompany the choir in anthems of all historical and musical styles, and render musically convincing performances of the entire repertoire of solo organ literature. 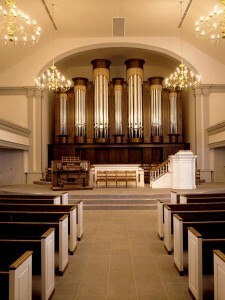 The organ has a full set of 16′, 8′, and 4′ couplers. The result is what people tell me is a very real familiarity with our sound, but it is one which has an unusually effective intensity and pervading power to really fill a room, even when playing softly. At the Dedication concert, played by Paul Jacobs of The Juilliard School, a ten year old boy was heard to say to his father: “the sound goes right through me” What more perfect testament to the org’s ability to be physical with its listeners can one receive? The organ has 33 independent stops, across three manuals and pedal keyboard. Five more stops have been prepared for future addition, in an attempt to keep the purchase price to a fixed budgetary figure. The façade pipes comprise the Pedal 16″ Open Diapason. The case and console are made from 1/2″ thick solid walnut; the carved pipe shades in the pipe towers are made of basswood to offer a light, delicate contrast. Thanks to all the parishioners and staff of Williamsburg Presbyterian Church, especially to the Organ Committee chair Laura Baetz, Sylvia and Ross Payne, and Organist Stephen Cook. I would also like to personally and publicly thank my Executive Vice-President Charles Eames for his untiring efforts to install a new organ in a building which wasn’t really quite ready to receive it; and to Tonal Director Brian Davis whose dedication to the perfection of our tonal style found its full flowering in this Church’s lovely acoustical environment.